It's been a while since my last review, hasn't it? Yeah, I'm sorry that you had to wait such a long time for a review, but I was kinda busy with 1.) procrastinating, and 2.) making posts for my brand new blog. Nonono, I won't abandon KCG; my reviews are here to stay, that blog will only contain ramblings about my homeland and other randomness. Well, later on, at least. But that's enough talk, let's get on with the reviews! 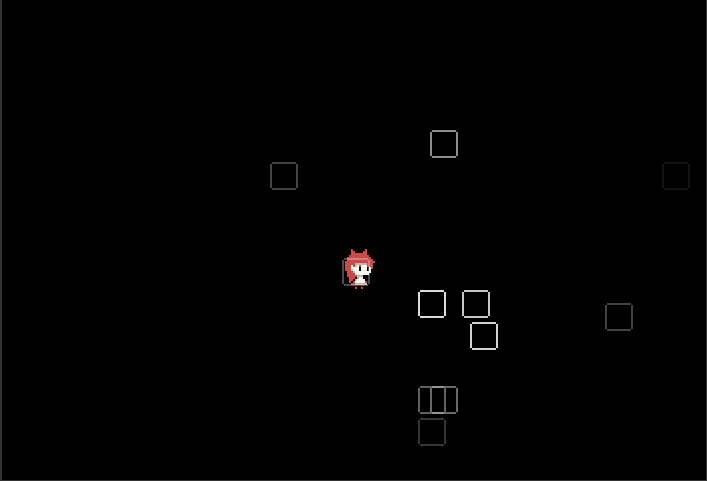 Our next game up is Raiyumii's The Valley Rule, a platformer that takes everything related to physics, twists and turns them, and throws them out the window. There's not much storyline to go with the game. For this part, I'll quote the description: "You are stuck “beneath the surface” and trying to find a way up. There seems to be only 1 giant door blocking your path." Now, here's the catch; the door can only be opened by activating the 4 runes surrounding it (thus the title of the review; I'm incredibly bad with puns, yes, I know that), with the triangles that can activate them scattered in 4 chests around the valley. And, of course, these chests are hidden in impossible places that require you to have near-perfect reactions, a sharp brain, and defiance of everything physics stand for. Here, we enter the world of 8/16-bit platformers once again, though it won't look like that in the pictures of this post. And that is the thing that makes the game so awesome; it looks incredibly realistic, with the players thinking the fluids and clouds are actually higher quality than they actually are, and only after inspecting them further can they find out that they're also 16-bit. That's really nice. The sound is also great. The music's really relaxing, and the sound effects just add to that relaxing feeling, which is really useful when you want to throw your monitor out the window when you see what the game wants you to do. Though I really do wish there was more than a single, plain mute button, because while I really like the music and sound effects, another person might not. Seems impossible? No, it isn't, that's completely doable. Extremely hard and infuriating, but doable. So, let's elaborate on what this game is about and how this is even possible to do. Our little cat-girl-thingy has to navigate through a labyrinthine valley to open 4 chests, solving puzzles along the way, and avoiding falling into the milk... or whatever that white liquid is. 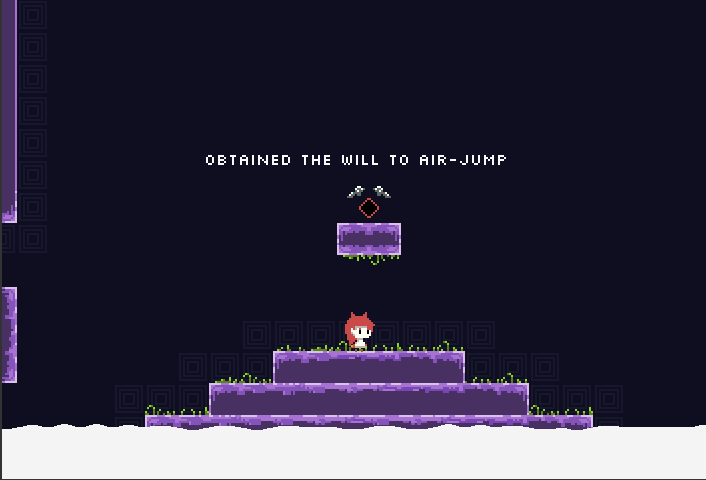 Not really exciting, but then there are two wills to get; the "will to air-jump", which is your generic double-jump ability, and the "will to climb", which lets you cling on walls indefinitely, slowly gliding down in the process. These two abilities let you climb that "Reverse Staircase" in no time, like a ninja, which makes the gameplay quite exciting, contrasting the music. Of course, then you have to fall down, which is actually more infuriating, considering you have to time your turns in the air perfectly to fall on the safe spot instead of the milk that surrounds it like a sea, making that part mostly sheer luck. And that's not the only part that's like that. Innovation is probably the only thing this game really falls short on. 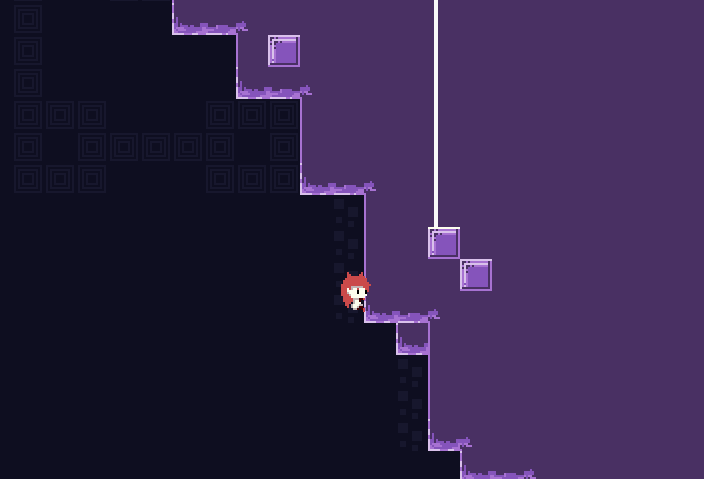 While the climbing mechanic is quite new in this genre, and makes things a lot easier, not to mention the level where you're essentially blind (pictured earlier), it's really "another puzzle platformer", which we have a ton of already, and the pixel-y graphics are now quite generic as well. The other little points make this fall into the average category, though. Finally, the other little things that couldn't fit in - or, rather, one rather big one. The game was originally made for Ludum Dare 29, which, for those of you who didn't know, means that the original game was made under 72 hours. And yes, I've played the original version as well as the updated one, and the only difference I've got so far was that the original was much more laggy. The fact that the game was basically made under 3 days, and manages to be as great as it is, makes me give huge bonus points to the creator. Well played.